Today was my CAFÉ MORTE. 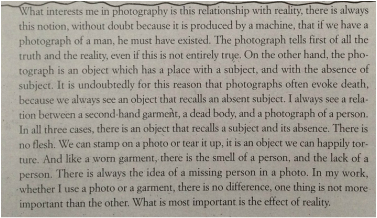 I opened with a passage of text by Christian Boltanski (see below). It speaks of how with a photograph, there is always an absence of people/ the lapse of time – photographs echo death. This element interests me with my own art practice, as I enjoy having the absence of a human within my work. It is often this that helps my audience place themselves with my films. I played a film of my diorama mountain and lake, where it opens with a view of everything and then slowly, the camera moves into the water and you become submerged. This film was played over two shopping bags of stones. This scene is based on a place in the Lake District, Wast Water. However, this sculpture, although based on this place, was constructed out of my memory – it is probably not a direct replica when placed next to a true photo of the original. The places that I create are all from memory. This one was constructed from what I remember at the age of seven driving past the place, my mother telling me about how people commit suicide there. Murders in woodlands, that I have seen on tv as a child with my family ( Midsummer Murders). These places have almost been forced upon me and have henceforth been preserved in my mind. People said they found my work arresting, part of it – and this is what I want them to feel. Like these events were put onto me, I want to somewhat pass them on for others to experience and see. Interestingly, some spoke of how, as children, they too had had imprinting moments. Someone spoke of how their mother would take them to a grave yard, and how he would play with the goat there. Another mentioned, how the ashes of people would be held in their house over night and how she and her dad would go dig the place for the ashes box in the graveyard. I recalled how dad first told me that our old gravedigger would sleep in the graves the night he dug them, ready for the next day. In each of these experiences, there is something very innocent and naïve happening. It is no wonder we have a heightened interest in death. With this film in particular, you get the sense that you are being taken on a journey to death, the slow progression making it almost calming, ritualistic, like it is washing over you. This piece is intended to focus on suicide. The two heavy shopping bags, almost in the placement of Justice Scales, are heavy enough to keep you under water. We then discussed that how some religions believe that those who commit suicide will end up in limbo. I feel that my scenes are a good reflection of this limbo. They are in a state of reality, yet they are not. They are uncanny. We spoke about how this piece could be more inclusive of its audience. There were the ideas of projecting the film lower to the ground and having water on the floor. There was also the suggestion of a heavy item of clothing being worn by the audience to again be inclusive. Finally there was the idea of the condition of the room – making it cold, dark, damp etc. This would involve more senses and further the audience feeling apart of it.